This one-minute video shows you highlights from the 1-minute Moving Postcard videos I shot in Berlin in 2013. Actually, there are two shots from my parents’ backyard, which is near Hamburg, not Berlin. For the last video of 2013, I had planned to make a 1-minute video comprised of favorite shots from all the 2013 videos. Well, it turned out that selecting just 24 shots or less selected from 52 different one-minute videos was the kind of challenge that begged for a different idea. So instead of just one video, I decided to make three videos for you, featuring highlights from Germany (In A Berlin Minute) videos, the United States of America (In A Brooklyn Minute and In A Colorado Minute) and from other countries (In Another Minute). You can watch “2013 Highlights – Other Countries – In Another Minute (Week 191 – I)” HERE. 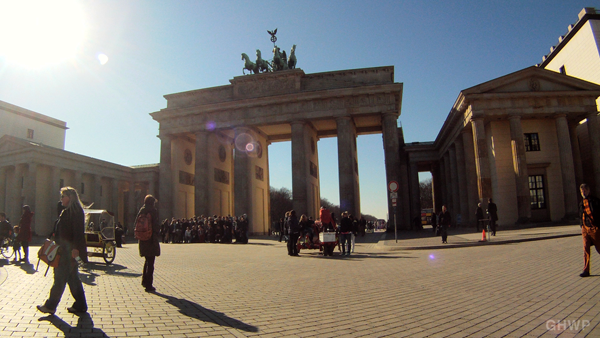 All the Berlin videos (2010 – 2013) you can watch HERE. The music in this video is a brand new instrumental version of “Sitting Still” by Jason Matherne of Goonygoogoo Productions, who has provided most of the music this year. Thank you, Jason, you seriously rock! Thank you to everyone who has been watching, sharing and commenting this past year. I wouldn’t be doing this without you. And a special thank you to my friends who have come along on video shoots with me around Berlin this year: Nicole, Adam, Gilly, Bine, Dave, Elke, Claire, Mutti und Papi – I miss you – but I know I’ll see you and go exploring with you again! Happy new year to you all (and please keep being brave and kind)!